The simple answer is no. 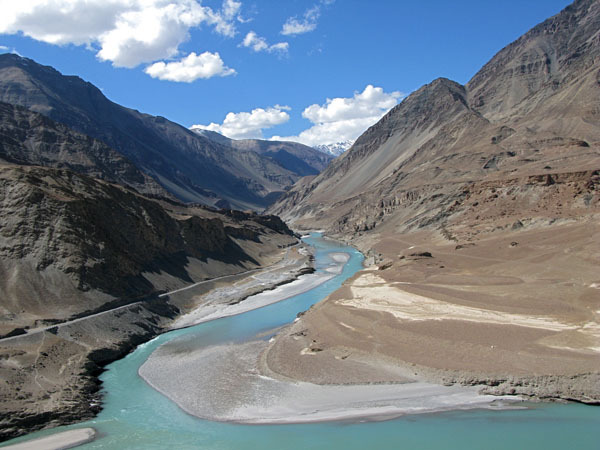 The Indus Waters Treaty allocates the water of the three western rivers to Pakistan, but allows India to tap the considerable hydro-power potential of the Chenab and Jhelum before the rivers enter Pakistan. The qualification is that this use of hydro-power is not to affect either the quantity of water reaching Pakistan or to interfere with the natural timing of those flows. Since hydro-power does not consume water, the only issue is timing. And timing is a very big issue, because agriculture in the Pakistani plains depends not only on how much water comes, but that it comes in critical periods during the planting season. The reality is that India could tap virtually all of the available power without negatively affecting the timing of flows to which Pakistan is entitled. If Pakistan and India had normal, trustful relations, there would be a mutually-verified monitoring process which would assure that there is no change in the flows going into Pakistan. (In an even more ideal world, India could increase low-flows during the critical planting season, with significant benefit to Pakistani farmers and with very small impacts on power generation in India.) Because the relationship was not normal when the treaty was negotiated, Pakistan would agree only if limitations on India’s capacity to manipulate the timing of flows was hardwired into the treaty. This was done by limiting the amount of “live storage” (the storage that matters for changing the timing of flows) in each and every hydro-power dam that India would construct on the two rivers. Hindustan Times, The Hindu, The Indian Express and The Economic Times. Taken together, these reports make astounding reading. Not only was the message the same in each case (“no real issue, just Pakistani shenanigans”), but the arguments were the same, the numbers were the same and the phrases were the same. And in all cases the source was “analysts” and “experts” — in not one case was the reader informed that this was reporting an official position of the Government of India. Second, there must be leadership from the Government of India. Here I am struck by the stark difference between the behaviour of India and that of its fellow BRIC – Brazil, the regional hegemon in Latin America. Brazil and Paraguay have a binding agreement on their rights and responsibilities on the massive Itaipu Binacional Hydropower Project. The proceeds, which are of enormous importance to small Paraguay, played a politicized, polemical anti-Brazilian part in the recent presidential election in Paraguay. Similarly, Brazil’s and Bolivia’s binding agreement on gas also became part of an anti-Brazil presidential campaign theme. The public and press in Brazil bayed for blood and insisted that Bolivia and Paraguay be made to pay. So what did President Luis Inacio Lula da Silva do? “Look,” he said to his irate countrymen, “these are poor countries, and these are huge issues for them. They are our brothers. Yes, we are in our legal rights to be harsh with them, but we are going to show understanding and generosity, and so I am unilaterally doubling (in the case of Paraguay) and tripling (in the case of Bolivia) the payments we make to them. Brazil is a big country and a relatively rich one, so this will do a lot for them and won’t harm us much.” India could, and should, in my view, similarly make the effort to see it from its neighbour’s point of view, and should show the generosity of spirit which is an integral part of being a truly great power and good neighbour. A great article, hope India listens. A wonderful article. Thank you for explaining the issue in such clear terms. The conclusion is quite damning for Pakistan, however. Seems to me the “neutral expert” was quite incompetent, issuing a limited ruling that reinterpreted the waters treaty to a point that it basically removed the safeguards Pakistan had had guaranteed, for access to its river waters when they are most needed. An Indian Mandela is not in the making, and asking for empathy from Indians, given the political climate in India with its extreme right now considered mainstream, is not a solution. Neither is it a viable position for Pakistani’s to adopt, relying on the good wishes of its traditional enemy. Imran, thank you for facilitating this article. What an eye opener. Pakistan is doomed unless something constructive is hashed out through the good offices of the WB and UN, otherswise I see nothing but war in the future, which this time will be mutually destructive. In general (globally) water manipulation is going to be a major issue and reason for future global conflicts. I hope this region can resolve its issue amicably. One arrangement now under strain is the 1960 Indus Waters Treaty between India and Pakistan. This agreement was the basis for the division of rivers after India’s partition in 1947. Having withstood Indo-Pakistani wars in 1965, 1971 and 1999, it is usually cited as a notable example of durability in adversity, but it is now threatened by three developments. First, India proposes to build a water-diversion scheme in Indian Kashmir that would take water from the Kishanganga river to the Jhelum river before it could reach Pakistani Kashmir. Second, India, which already has more than 20 hydro projects on the three western rivers allocated to Pakistan in its part of Kashmir, is now building at least another ten and has more planned. Each of these conforms to the letter of the treaty, since it does not involve storage but merely run-of-the-river dams, in which water is returned downstream after it has been used to generate power. However, Pakistan is worried about the cumulative effects. 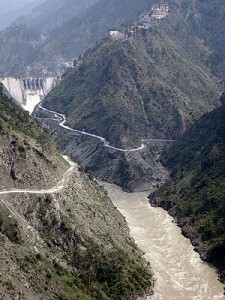 When, in 2005, it complained about another Indian hydro project, the dispute went to arbitration. That resulted in a ruling broadly favourable to India which left Pakistan unhappy. It feels that the spirit of the agreement has been breached and the treaty needs revision, partly because advances in technology make it possible to build dams that were not foreseen when the deal was signed. Third, Pakistan badly needs more reservoirs. Storage is essential to provide supplies in winter (two-fifths of the Indus’s flow comes from the summer melting of glaciers) but Pakistan’s two big dams are silting up. It would like to build a new one in Pakistani Kashmir, but India has objected, and the money is not forthcoming.